Here’s the internet site, and there is more at RenewEconomy. It works because it doesn’t go very fast or very far, just 3 km to North Byron Bay. There is a dearth of public transport in Byron Bay, so apart from anything else it will be welcomed by non-drivers. However, the Oz carries a story saying some locals who have businesses near the line want it shut down. There is always a whinger not far away! I believe the speed is governed to about 20 or 40 kph, depending on the scenery, and the trip takes 7 or 8 minutes. QUEENSLAND is on the cusp of a new gas boom with exploration for shale gas to start in the Cooper Basin. In what could be a new money earner for the state — and ease the cost of energy prices — millions of dollars will be spent to determine if the extraction should start. It is understood Geoscience Australia estimates prospective shale and tight gas resources in the Cooper Basin could provide 29 years of east coast gas at current production rates. The Turnbull Government will use cash from the $30 million geological and bioregional assessments program to evaluate the priority area. Seems there will be enough gas for the domestic market, but prices have only gone from impossible to difficult. “Extremely challenging” the word. I worry that we will eventually find that gas fugitive emissions are higher than we thought, and the fact that they are 100 times more potent the CO2 in the first year, means that gas is not the ‘clean’ alternative to coal that policy makers think. No matter what the urging it seems state CSG and fracking bans will remain. We’ve had Greenhouse conferences ever since mostly on a biennial basis, but drew a blank in 2017. That was a year earlier than James Hansen’s testimony to the US Senate in 1988. Scientifically the 1985 conference a great success, creating new scientific networks and momentum – a “field-configuring event”. Marc Hudson says that politically climate change has never gripped. 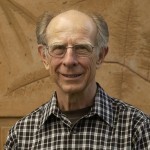 Ironically, Graham Pearman, the conference organiser and senior CSIRO scientist, retired in 2004. He says he was reprimanded and encouraged to resign for speaking out about climate change. 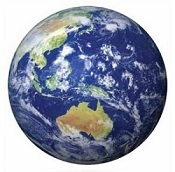 It is perhaps fitting then the Giles Parkinson writes that Why South Australia must, and will, lead world on renewables. South Australia has averaged 63 per cent from wind and solar over two months, and is going hard for more. There is now a big emphasis on storage – pumped storage, batteries, molten salt and even hydrogen fuel cells. They are also promoting demand response, energy sharing and behind the metre initiatives. The new AEMO report highlights that 9.2 per cent of the electricity generated in the state over the last financial year came from small-scale (sub 100kW) of solar PV on the rooftops of households and businesses in the state. That level of rooftop solar penetration is a record for any major grid in the world, and the contribution of rooftop solar is likely to have been well over 10 per cent in the last year when larger rooftop solar installations of more than 100kW are included. The Tesla battery has already been in action. What you have to understand that in the Turnbull/Frydenberg world, everything the Commonwealth does is good and everything the states do is bad, especially SA. 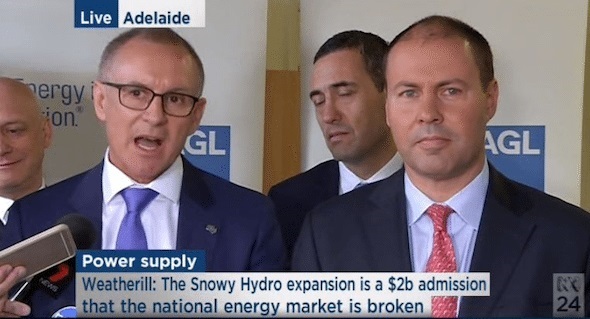 So in the Turnbull/Frydenberg world, Snowy 2.0 at double the price originally estimated, is still good. According to the feasibility study Snowy Hydro 2.0 may cost double but is still ‘feasible and viable’ without tax payers money. The cost has blown out from $2 billion to $3.8 to $4.5 billion, and is expected to be operational from 2024. The specifications in terms of delivery of power are impressive. Energy analyst David Leitch is not so sure about the value of the project. For starters, Snowy 2.0 will increase emissions as the water will be 60 to 70% pumped up the hill by coal power. South Australia impresses with its coherent strategic planning of the whole electricity system. Snowy 2.0 seems opportunistic, and so far has no power purchasing agreement. Chances are it won’t initially, but could later from old coal-fired producers. South Australia is heading for self-sufficiency, even an exporter of power, and you’d have to think they’ll get there. Queensland is already in that position, and is likely to stay there. Ironically, Snowy 2.0 could come into its own by picking up power from rooftop solar in NSW and Victoria, then feeding back in to allow coal to operate at a higher 24/7 level than would otherwise be the case. That might actually be the main driver behind to project. However, new renewables have to be firmed, according to the ESB. As time goes by developers of renewables in NSW and Victoria may be able to use Snowy 2.0 as a firming agent. Opposition spokesman Mark Butler, however, says that the National Energy Guarantee is designed to stop large-scale renewables development in its tracks. We’ll need to take a closer look, but it’s not clear that Snowy 2.0 is an unmitigated blessing. Last night I felt a tad tired. I’ve been cleaning up yards in preparation for Christmas, with heat up in the 30s. I wear a pedometer, and this week I’ve been averaging around 27,000 steps a day. So last night I decided to finish this CC rather than start a new Salon from start. Today I have to help an 88-year old, because they are having a big Christmas Party, plus a bloke who has just lost his mum. We’ll see what happens after that. So more broadly, excuse the pun, we can only see Snowy making sense if Australia has a much higher share of renewables than contemplated under the NEG. I agree. Much more renewable primary energy generation is required to reduce GHG emissions. Brian, an excellent set of articles from your powerful researching skill set, yet again, and I do mean all of the threads up at present. I am going to put this comment here in a power related Climate Clippings as there is a connection when I think about it. My final thought for 2017 on the subject of housing affordability going forward. The problem is that there are very few solutions, if any, that do not get swamped by capital growth market forces and rapidly rendered useless. To provide an alternative I am proposing, in the vein of US style rent control, a new Capital Growth Restrained Property Title. “The other day I visited a cousin in Melbourne living in a house (property) that is 5 metres wide and perhaps 40 metres long. The type of house that would have been a railway workers house in the 50’s. Little rose garden in the front and enough room to swing a clothes line at the back. I asked how much she had paid for this? “$1.8 million, but now worth well over 2”. A while ago I asked my friend, Bill Kerridge (an economist who had been a ministerial aid during the Whitlam government then later software developer supplying lease finance software), “If I can build a 3 bedroom house for $350,000 including the land and make a good profit and I sold it for that price, but the very next day the building would be saleable for $600,000, what price should I sell it at”, to which the answer is “well, $600,000 of course, as the person who bought it for $350,000 would do just that, selling it the next day to take the $250,000 profit”. That is the dilemma of housing affordability. It occurred to me that there may be a solution taken from the American “rent controlled” model. Only this would require a legislated price controlled class of property. In such a model new properties would be sold for their production price but thereafter the value of the property would be limited to its original value times the increase in real wages plus the cost value of improvements. The main stipulation is that such properties would be limited to owner occupiers. With such a property class available state governments could make special land releases to enhance the availability of affordable housing. Further, this prospect would serve to take much of the heat out of the property market to cap capital growth with out causing a crash of general property value (this is a safe claim as the build rate of value controlled properties would represent a tiny fraction of the greater property stock). These properties would give young first home buyers the opportunity obtain property within the scope of their income, and as their income improved allow for savings to be accrued without massive loss to interest rates or inflated rental. There are of course pro’s and con’s for those who participated in such property ownership, but I know that I would not hesitate buying such a property myself. There are many pros and many cons to this idea but as I have thought them through there are solutions all of the problems encountered so far. The one major negative is that once a person has stepped out of the capital growth mainstream they are no longer in the capital growth windfall zone, but then the same applies for anyone who changes their location for property affordability, their capital keying is lost or reduced. But on the other hand owner occupiers have reduced drain on their income from bank interest, rates growth, property taxes, insurance costs, etc. And it is that very reason why I posted the comment in this thread. CGRPT’s mean that such title holders will have more discretionary income to invest in their solar energy assets, and thereby achieve further expenditure savings as Climate Change impacts continue to grow. One of the more interesting aspects of such a mechanism is that it would allow governments to re-engage with social housing but without incurring cost or responsibility, other than overseeing the supply to demand pressure which is managed with land releases and at what price. At present new land releases are automatic property developer bonanza’s which largely eliminate any real competition in new property releases. That’s how it worked for my Wife and I. We camped in the car all night to be first. It’s where we first met our neighbors and still giggle about it at BBQs. The profit in your example is motivation to build where it’s needed most. In ” overpriced ” dwellings the structure cost is dwarfed by the land cost. That due to under supply both naturally and Government caused. If governments must intervene then abolish stamp duty on dwellings with a certain amount of solar and storage perhaps. The problem, Jumpy, is that new development is structured to deliver new property at the local market property perceived value. ie it is impossible to provide cheap housing without making it substantially more flimsy, or to provide land at a level that young people, who arrive in the market place already heavily loaded with education debt, at a level that can be afforded or even saved towards under inflated rental rates, without this being seen as unfair other groups. CGRPT’s (Capital Growth Restrained Property Titles) provide a medium in which benevolence can be delivered for useful benefit without its being squandered. It works on the favour passed forward principle. They are not for everyone as they are designed to fill the needs of those disenfranchised by the growing property divide (which I suspect is not yourself, Jumpy), and carry not insignificant disadvantages. CGRPT’s can be converted to regular title by paying the difference in property values to the state government, ie rebalancing the advantage. This is what a developer would need to do if he needed to expunge a title in order to build..say a shopping mall. He would also need to pay an incentive (CGRPT value plus) to the occupier to move. I think that scheme would be a huge disincentive to development and result in less supply and send prices up. Where exactly has this been tested ? …you’re saying now that lowering prices increases prices. That is illogical. The availability of low cost Japanese cars has not sent Mercedes into receivership, far from it. Also the Japanese phenomenon has served to increase the quality and reliability of all cars while making them affordable for most people around the world. CGRPT’s will fill a need for a portion of the market, the portion that is currently fully excluded from ownership under the Howard model of property capital growth and education cost. Where has it been tried? No where, that is what innovation is about. What we do know is that it is impossible to offer lower cost accommodation (that isn’t effectively living on the street) under the current market based system. To decide whether this is good or bad you have to look at the choices. With property value growth outstripping income growth many fold, the most certain outcome is a property value crash accompanied by a very substantial recession. Against that certainty CGRPT’s perform the role of a (capital) pressure relief valve without causing deflation. The negative is that it will be argued that CGRPT’s will create a subclass of property ownership. I would argue back that we already have exactly that in the form of commute distance to the affordability fringe, along with the huge negative social impacts that time and cost spent travelling cause while also introducing the wild card of unpredictable future (fossil) fuel costs (renown for triggering recessions). On solar if you google “white cliffs phot voltaic solar concentrator programme” you will get a window into our failure as a solar nation, “its not for want of trying”, and click images. We have the “know how”, we just don’t have the “go Pow”! Colonial Australia took the “whinging Pom” and created the Ocker Knocker! You can put a sock in the Pom but the Knocker is hard to defeat, especially when they are politicians. In the past when I was espousing a 60% efficient solar system (solar energy, water heating, air conditioning all in one) for houses that could power the country, it was essentially this principle but based on the 40.5 percent efficient Spectra Lab solar converters. These concentrators have to track the sun accurately and have the added need of requiring cooling, but they can cope with 110 degree C temps and that temperature is suitable for absorptive air conditioning. So when you run the sums on this technology it is awesomely capable of delivering all of our energy needs with just a little help from Liquid Piston and their awesome little engines for back up power. I only learnt about the Solar Systems (Pty Ltd) and John Lasich last week when in Melbourne. I take my hat off to their efforts, and shed a tear for their frustrations. Fixing a price below profitability reduces incentive to produce, leading to shortage, thus price increases. Hugo Chavez tried it on. BilB, the link fails. Is this what you had in mind? I also googled as you said and got this inter alia. On your legislated price controlled property class I can’t see in principle why it would not work, but have no expertise in the area. Our experience of living in a property is not substantially influenced by its value in dollars. If we have more dollars, then we spend more on other things, stimulating economic growth in those areas. It is a major social concern that the young are increasingly being locked out of property ownership in places they’d like to live. Sooner or later politicians will have to be brave enough to do something that makes a difference. Jumpy, who said anything about “fixing a price below profitability”? Where did you get “below profitability” from, Jumpy? If you had read it all carefully you should have noticed that this is about being below “maximum exploitation level” while still being profitable. Your comment is mixing watts with grams and multiplying by air pressure, Jumpy. Illogical! Thanks, Brian. Your link the correct one. I should have added that the system I spec’d was not dish solar as at White Cliffs, it was more a matrix of linked tracking modules fitted to houses in a solar well created by a “mansarded” roof feature, ie invisible from the ground. …..Is a brilliant observation, and worthy of much discussion. 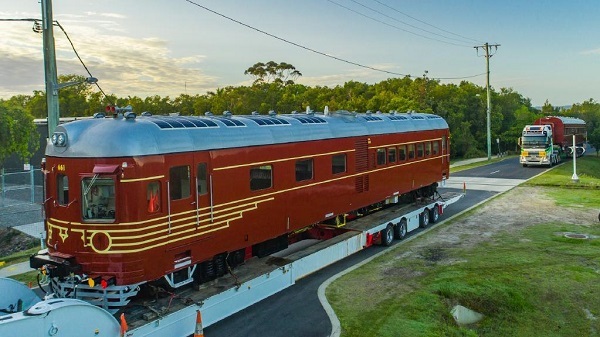 Note: Byron Bay’s “Fist” Solar Train. Look, I applaud outside the box thinking, but a house is just a product like any other. Every time price regulating , to keep it low, of anything is tried it has the opposite effect. Increase supply is the only remedy that works. So it is the property resale price that concerns you, Jumpy. I think here you are trapped by your preconceptions. If you care to look at the pre 1997 property value graph you will see that for decades it was largely flat for the majority of areas. ie people made no profit from the sale of their property. Relocation for decades was a zero sum process. It was John Howard’s legislation that kicked off the property boom, and in an unsustainable way. It is NEVER mentioned that one person’s profit is another person’s loss. What you are advocating is that there should be a steady supply of property losers or property treansactions are somehow inappropriate. Lets test the uniformity of your thinking. How much profit will you make on the sale of your utility (vehicle) after using it for 5 years? Let me guess, you are going to make a huge loss on it. But according to your thinking this will somehow lead to Chavez like economic collapse. And apart from that despite the fact that people make a loss on the sale of their used cars, car companies continue to thrive, cars continue to become more reliable and require less maintenance, and there is a steady supply which exactly meets demand (usually). OK so your pricing argument falls flat on its face, lets look at the supply argument. What you are saying is that in order to bring house prices down by the 50% that they have to fall by in order to be affordable to those who are priced out of the market. That will require a very significant number of additional houses built, on land that needs to be paid for, connected to services that will lay unused for a significant period and all done with the uncertainty of demand location. And that will all need to be financed by the property developers themselves (banks do not lend to speculation particularly where the intention is to erode the value of the product and at the same time the value of all of the other properties that they the banks are exposed to). Do you see where this argument is heading, Jumpy? Straight down the toilet from my view point. So the oversupply of property argument is dead dead, that only leaves the part where Libertarians hate regulation. That is a fair position to hold, particularly when it comes to property. The thing is, Jumpy, that CGRPT’s are not mandatory, they are not intended for all new property development, no-one will be forced to take them up other than those who are forced by their dire circumstances. CGRPT’s are a device available for some people to chose to participate in. Consider some of the other property devices available, Strata titles for instance. I personally hate Strata Titles particularly where they apply to units in blocks of flats. I hate blocks of flats too. I had to use one in Melbourne over Christmas, and the whole scene leaves me cold, and that is why I choose not to live in one. Did you here that, I exercise by choice to live in a house with soil to sun and clear border to border to border to border title. That is my choice. Now I could own that property with a market rate title, or I could have the choice to own that with a market price restricted CGRPT title. If the type of title meant having a house or not having a house which do you think that I would chose? Now if I chose the CGRPT property which I could afford because there is no profit made in the purchase from one buyer to another, I accept in the so doing that I too would make no profit from selling the property when I choose to relocate in the future. Hopefully the lower mortgage cost would give me the opportunity to save at a far greater rate than I would otherwise. Now here is the opportunity to explain to me in the least number of words possible (your average) what is so wrong about that? I opened the argument with the notion of rent controlled properties in the US. My bad, as these are generally not considered to have the desired outcome, however in the CGRPT model the property owner and the renter are the same person, there are none of the conflicts that occur in the rent control model, so from the perspective of the triggering notion you have an argument, but not for the fully developed CGRPT property ownership model. Because it’s rubbish, sales are consensual trades in individual value judgments as you latter go on to articulate. Tell me, who is going to supply these homes ? By all means take the leap yourself, best of luck to ya. a house is just a product like any other. I beg to differ. There was a bloke called Abraham Maslow who identified a hierarchy of human needs. His big theory of self-actualisation is a distraction here, and i wouldn’t like to defend it. However, he did us a service of identifying the basic human needs of safety, shelter and sustenance. Governments in the past put in a huge effort in social housing. There was an extremely valuable program back in April on the history of social housing on ABC RN’s Rear Vision program. If you scroll down you will see that in The Netherlands social housing was so successful that the EU authorities had to put a stop to it so that the capitalists could make a profit. In the modern society not too many people object to a modest profit being made out of the supply of water and electricity and other essential services. However, excessive or windfall profits on the need for decent shelter could be held to be unethical. Jumpy the properties would be self contracted (by the home buyer) or tendered for by the market if organised by a benevolent entrepreneur (believe it or not there are many reasons why one would contract low cost housing [a mining company for instance or an enterprise that saw value in a labour supply less financially stressed by high real estate prices]) or the government. That process works very well. I know a builder who won a tender to build some 98 properties up in Gladstone. Finished on time, under budget, made a good profit, and the organisation got a very good well under market cost deal. There are many, many ways to build dwellings and other property types. With the CGRPT title if the government provides the land at a discount and any of these first home buyer incentives are applied then those savings become enshrined in the property value for the life of the title. The property buyer gets the benefit of the saving in his mortgage payments, but he does not get to cash them up if and when he sells the property. That is the principle difference in this title type. You are only focusing on a perceived loss of profit because we live in a country that has had a twenty year property boom, you are not considering that in a falling market the CGRPT property will be stable or continue to rise in value even if only slowly. That is interesting on Netherlands social housing, Brian. I must research that, and look up that program. In 1973 my then wife and I committed to pay back the mortgage we had taken out to pay for the house which we built. Total cost of house and land was $16,500 (ahhh, the good old days!). The price of that property now, allowing for inflation, should be around $210,000. This would be pretty much the price if it was one of Bilb’s CGRPTs and I think would reflect a reasonable return on our investment (I have a vague recollection of calculating the total we would pay if the mortgage had run its course was around $80,000). However, should the current owner wish to sell it the asking price (taking into account recent sales in the area yada yada yada) would start somewhere north of $400,000. Btw, churches led the way in philanthropic accomodation for the poor with voluntary donations before government crowded them out useing forced taxation. I can’t download Brian’s audio but Dutch social housing was a church initiative too. My pregnant Wife and I first lived in a caravan. My Son and his pregnant Wife first lived in a 4 bed, 2 car garage, 2 bathroom house with a large yard. Both tradies but my wife worked, his doesn’t. Dutch housing from a definitely not right wing source. Thanks for the link, Jumpy. I’ll print that out as i will be in Maasland in a couple of weeks and staying with an Architect for a week, so will get some qualified comment. I do know that land availability is an issue. Land is very valuable to the Dutch for obvious reasons. While there I am going to spend three days at the Dusseldorf boat show with my daughter who is planning for her first (own) home to be a boat, and in Europe. Housing bubble a myth?? Really?? Never said housing bubbles are a myth, just the cyclical nature. For what it’s worth, I’d be living on a boat right now if my beloved would budge an inch. Our beautiful blue Pioneer River is crying out for council to allow a mooring enterprise or 3, even with the 6m tidal movement. And a few miles to the Whitsundays. Our first home was a hole in the road. A pot hole is no place to raise youngsters, glad you progressed zoot. I’ll wager them youngsters got a better first residence. BilB, it sounds as though there may be special problems in Amsterdam. Jumpy, the account of the Netherlands does not mention churches, rather nonprofit organisations. It seems the government was involved from the outset (local and national) in low interest loans and subsidies. You don’t have to listen. Here’s the link again. Where it says “transcript” on the left, go directly to the right where it says “Show”. Seems we have about 5% social housing, in Europe it’s about 20% and in The Netherlands was up over 40% when greed entered the situation, partly from privatised housing associations. Peter Martin says here that the low income renters are the hardest hit. The government needs to do something about increasing welfare payments or other more direct strategies, which I would favour. Peter Martin has no solution of the problem of large cities like Sydney, where people can’t afford to live near where they work, so are left with horrendous commutes. As usual a private institution gets taken over by government, has a sugar hit, then collapses. Mentioning Amsterdam reminds me that AirBnB coupled with cheap airfares has created havoc in that city along with a resentment of tourists. There has been a huge buy up of low cost accommodation to be refitted for casual tourist accommodation. The bad housing conditions and worry about health of the labourers, they were the start of private initiative by factory owners. Then in 1901 the government became also worried about the health of the labourers, so that was the beginning of a public private partnership for social housing in the Netherlands because the government, they did not take over this private initiative, they invited them to become registered associations on behalf of the Housing Act, which meant that they had access to low interest government loans. So the government was involved in housing finance. This all was quiet small, this initiative. I think after that period about 10% of the housing stock became social rental housing up to the Second World War. After the Second World War there was this huge housing shortage and then the government gave priority to re-building the housing stock as fast as possible, and they used the private housing association as well as the public housing companies of the municipalities to rebuild. So there were huge subsidies for social rental housing, and that meant a big increase in the stock of social rental housing. It went up to 20%, 30%, even 40% in the 1980s. So even after that period after the Second World War there was still support for building and managing social housing. Up to the ’70s when urban renewal was an important priority for the municipalities and for the central government, so up until then there was still huge support for a broad social housing sector. This all changed in the 1990s, that was the period of deregulation, privatisation, more emphasis on market mechanisms, more emphasis in housing policy on home ownership, which also led to becoming housing associations financially independent from the government. So that was a real change in our policies. And then in the late ’80s, housing associations were independent, privatised, professionalised. There were some fraud cases, there were some cases of bad management. That all led to a parliamentary inquiry, that’s a very important inquiry in the Netherlands, where the question was what did go wrong in the Dutch housing system? And the conclusion was that supervision on these housing associations was not adequate. So that’s a very quick summary, but this all resulted in a new Housing Act, and social housing in the Netherlands is now only accessible for the low income households, no more for higher income groups. I need to point out that your link is to a Dutch association of social housing organisations pamphlet of 2013, and that there was a new Housing Act to be implemented from 2016. This reference is a powerpoint presentation, but it still sounds complicated and to some degree problematic. So your final sentence seems a gross misrepresentation of what is happening. Funnily enough, no they didn’t. Started off in holes in the road, just like their old man. When I were a lad, we lived in an open drain beside a highway: traffic was slow, but the droppings from the horse-drawn milk trooks were soomthing ‘orrible if it were me Mum’s washing day. And in a big storm, we were washed away down side of highway. Could end oop miles away and kids ‘ad to start at new school. But me Dad said, “Youse ‘ave a good look at coontryside as floods sweep us along. Aye it were like ‘oliday. Never needed no bloody posh “river cruise”. We ‘ad our very own drain cruise. Them were good days. Playin’ with pebbles or old ‘orseshoes, throwin’ horse plops at me brother once they got a bit solid-like. Rabbit and hare stew on a good day. Would’na swapped it fer anything. Never mind, never did get that, but you had to respect ‘is aspiraytions. Cheers zoot, you looky booger!! In terms of affordable housing the crucial thing is to have a good supply of low cost, secure, affordable rental accommodation that provides secure accommodation for people who can’t afford more expensive accommodation and those who need time to accumulate the funds they need to buy a house. If this supply is there the rest of the market can look after itself even if this means that the price goes all over the place. But there has to be something said for the character building exercise that is saveing the deposit. The self control and single mindedness of a couple going without in the present for reward in the end. It’s hard but a valuable process, forges solidity and reduces selfishness that quite frankly this modern generation could use a bit more of. Thank you kindly. Ah’d coom over to your luvverly road hole, but the drain needs a bit of a tidy. Big night. Soomone threw out a half bottle of fresh water from their jinker, so it was party time!! Jumpy, on character building you need to read the chapter of Richard Sennett’s The Corrosion of Character, then the review. How can a human being develop a narrative of identity and life history in a society composed of episodes and fragments? This was written 20 years ago. What would he make of it now? Coming to think of it, I think I’ll take this to the John Howard thread. Here’s an example of some parliamentarians that seemingly appear to me to be gas- and energy-illiterate. Submissions were called for, and 36 were received by the Committee, including mine (#2). Two full day public hearings in the Macquarie Room at NSW Parliament House were scheduled on Wednesday, 28 January 2015, and on Monday, 2 February 2015. I attended both these public hearings as an observer and heard most of the testimony given, missing only perhaps the first twenty minutes each day. I thank the Committee for allowing me to appear before this inquiry today. Gas energy and security is one of the biggest issues facing the people of New South Wales today. In 2014 New South Wales consumed some 150.4 petajoules of gas, the average household consumes 18.3 gigajoules per year, approximately 39 per cent of households are connected to mains gas and 12½ per cent are connected to bottle gas. This is a vital energy resource, particularly for eating and cooking for many individuals and families across this great State. In addition, gas is vital to much of the economic life of this State: 52.2 per cent of our gas is used for industrial purposes, 14.3 per cent is used for households, 6.2 per cent is put to commercial use, 26.4 per cent is used in electricity generation and some is even used in transport. In all there are more than 1.1 million gas users in this State; therefore the importance of securing this gas supply cannot be underestimated. Many long-term, low-cost contracts for imported gas supplies will be coming to an end over the next three years and it is becoming increasingly difficult for long-term supply arrangements to be reached given the state of the change in the east coast gas market, with Queensland export hubs now coming online. So, you would think a key question would be: What quantity of gas reserves does NSW have remaining? We had to wait until the final group of witness testimonies of the final hearing day. Would it be fair to say that the New South Wales known reserves are all known at this stage, or at least the substantial gas reserves are known, or is there room for exploration to continue in the future? There is certainly room for exploration. As I indicated, there is an email that signals the potential supply opportunities in New South Wales. The most important thing is that we need to prove the reserves. That is often overlooked. One of the important aspects of exploration is that we need to understand the nature of the geography and the reserves. That is why exploration is a critical feature of the development of the gas industry. The known reserves in New South Wales at the moment are extensive. You might need to take this question on notice. At current levels of production and consumption, how long will those reserves last if they are used purely for domestic purposes in New South Wales? Based on the Australian Energy Market Operator’s figures and on today’s demand, which obviously will increase, we are saying that we have of the order of 500 years of supply. That gives a lot of time for solar PV technology to develop, does it not? Global proved gas R/P at the end of 2016 declined to 52.5 years, and Australia’s proved gas R/P declined to 38.1 years, according to BP Statistical Review of World Energy 2017. And although the NSW inquiry included liquid fuels in its terms of reference, the final report tabled in the NSW Parliament on 25 February 2015, included less than 3 full pages (pages 46 to 48) of references from submissions on the NSW fuel refinery closures, and 7 lines of Committee comment. Prospective resources are estimated to be potentially recoverable from undiscovered accumulations – in other words; a guesstimate. Prospective resources (assuming they are all discovered and recoverable) would last >500 years. 2P reserves are the only figures that should be considered seriously in terms of recoverable reserves. These reserve quantities were all for coal seam gas (CSG) reserves – NSW had no commercially viable conventional gas reserves at that time. More NSW gas reserve data may have become available since, but did Fennelly tell ‘porkies’ under oath, on 2 Feb 2015, about how much known gas reserves supply NSW really had at that time? Based on the information given, I believe so. Why didn’t the Committee explore the source/derivation of Fennelly’s “500 years supply” statement further? I suspect they did not want to open a can of worms. Does that serve NSW’s energy security and economic interests in the long-term? I don’t think so, because I believe it gives a false indication of NSW’s indigenous gas supply. And does the media have the wit to see and report the situation for what it really is? I think not. I think the public is blissfully unaware of the real situation and is led to believe through intentional/deliberate misinformation that there’s an abundant, affordable NSW indigenous gas supply. The evidence I see indicates otherwise. So what can the Government do about rapidly rising gas prices? To stop price rises there are two things that the Australian Government can do. Both are very difficult politically. The first is to introduce a gas reservation policy. Such a policy would need the agreement of the Federal Government and the New South Wales, Queensland, Australian Capital Territory, Victorian, Tasmanian and South Australian governments. The second is restriction on gas exports. Sound/look familiar? It’s taken two years for the Australian Government, to be figuratively dragged kicking and screaming along the way, to get to a situation that Grudnoff (and probably others) have been recommending. Beyond these two very difficult solutions—and highly unlikely solutions—the New South Wales Government can only help gas consumers cope with the price increases. This could include: acting on recommendations such as those from the Alternative Technology Association that would help residential customers to fuel switch from gas to electricity; remove subsidies that encourage uneconomic use of gas; remove subsidies that encourage uneconomic expansion of the gas grid; informing gas customers of the potential advantages of switching to other fuel sources and applying energy efficiency measures; facilitating the identification and financing of economic fuel switching and energy efficiency projects; and, finally, reducing infrastructure costs by rationalising the gas grid where economically advisable. I’ve acted on some of this advice (from BZE’s Buildings Plan and the ATA Submission #10 – Are we still Cooking with Gas?) and invested in solar-PV panels, a hot-water heat pump system replacing a gas-fired system, and installed a reverse-cycle air conditioner replacing a gas space heater, and made substantial savings on ongoing energy (gas & electricity) bills. On the evidence I see, the residential gas supply network should be decommissioned by no later than 2035. The real challenge will be to transition industry away from gas.